I use regularly my very light playing schedule as excuse to read non educative chess-books. I find it much more enjoyable to read anecdotes and stories about chess than studying modern opening-lines or solving all kind of exercises. 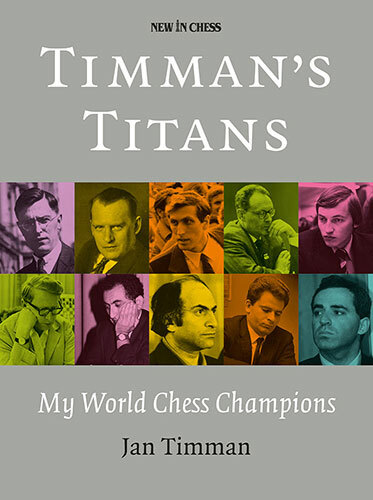 I very much liked reading the books Nadorf x Najdorf and Timman's Titans in the last couple of months. Najdorf's daughter writes some kind of biography about her dad from her very special but at the same time also extremely interesting point of view. Jan Timman pleasantly surprised me with his very witty style of writing in which he managed to share a personal story for each of the 10 former world-champions. 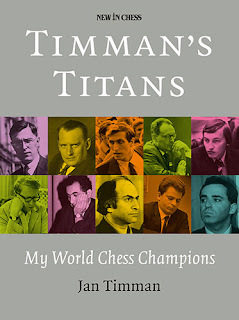 Jan Timman's book has contrary to Najdorf's book a lot of high quality analysis. Jan clearly had fun finding a number of ameliorations upon the already classic My Great Predecessors written by former worldchampion Garry Kasparov. The release of the series has been almost a decade already so Jan obviously was able to use much stronger software and hardware than Garry Kasparov. Beside his own games against the world-champions Jan focus especially at the less or even unknown games. Hereby a lot of attention is given to a bunch of secret training-games which Botvinnik played between 1936 and 1970. Ragozin, Kan, Averbakh and Furman were Botvinnik's most regular sparring-partners. A game played in Moscow 1953 against Ilya Kan, famous for the Sicilian variation bearing his name, caught my attention. Particularly move 16 in which Botvinnik makes a remarkable choice. In 1998 Jan added 2 exclamation-marks to the move. Today he still thinks it is the best practical choice in a game but at the same time he also shows how the current engines manage to neutralize the concept. In my most recent class I was pleased to use this fragment. After discussing a number of good examples of pawnstructures, I found it important to warn my students for too dogmatic play. Dynamic elements must get priority upon structural aspects. In other words you sometimes need to weaken your structure to get the pieces active. As my students often wonder if this kind of chess can also occur in their games, I had prepared some examples from my own practice. The at that time 21 years old Dutch Sebastiaan Smits impressed me with his audacious 17th move. You can replay the complete game in my article the neo-scheveningen. Another example happened in 2003. The same thematic move occurred on the board in Open Le Touquet. The German Erwin Hein seemed to me much stronger than his rating. So here it didn't end well but in the game black did achieve sufficient counterplay with the idea. After these examples my students were convinced of the importance to also look at less common themes we find in grandmastergames. You never know what to expect in a game. Also eventually learning a lot of small new things will help you making another step forwards at chess.